Enjoy the serenity and beauty of this Caribbean paradise when you swim with the dolphins on the island of Anguilla. The Dolphin Swim Adventure gives you the opportunity to get up close and personal with these amazing marine mammals and learn about their habitats while swimming in the blue waters of the Caribbean. Experience the thrill of swimming with Dolphins in the amazing waters of the Caribbean when you visit the island of Anguilla for a Dolphin Swim Adventure by Dolphin Discovery. You will have the chance to relax on white, sandy beaches and enjoy the serenity of the islands while also experiencing the dolphin swim program where you get to be pushed through the water by dolphins and even receive a big, wet hug from these friendly marine mammals. 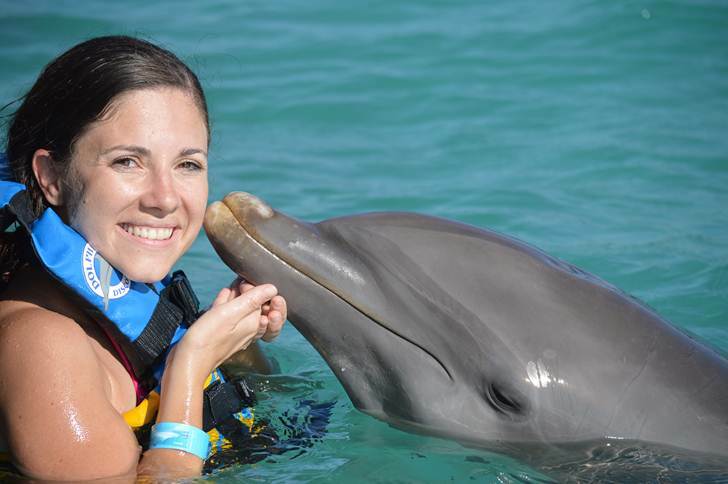 The Dolphin Swim Adventure not only provides visitors with a deep understanding of dolphins-human interaction but also gives them the chance to experience firsthand their many habits and behaviors. The adventure tour includes 30-minutes in the water after a 15-minute briefing as well as transportation by ferry to and from St. Martin to the island of Anguilla and ground transportation (taxi) to and from the Dolphin Swim Adventure tour. 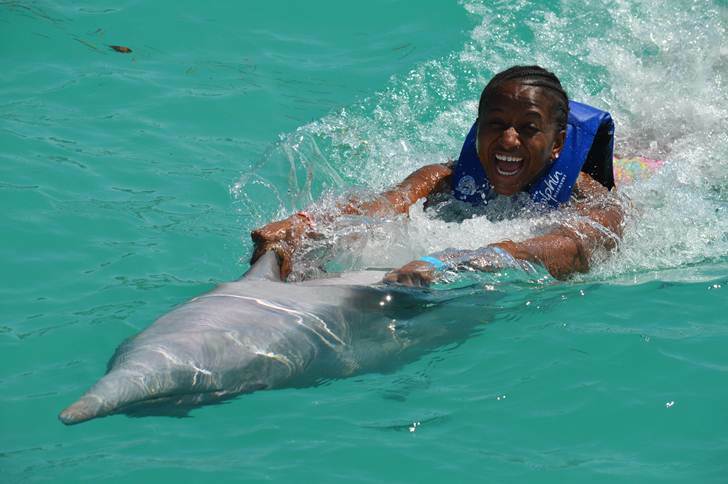 While on the tour, you’ll even experience a belly ride from our wonderful dolphins. The belly ride allows visitors to feel as though they are part dolphin when they lay on the dolphin’s belly and get swept across the water as the dolphin swims backwards. In addition, visitors will get the chance to experience a boogie board ride like never before. 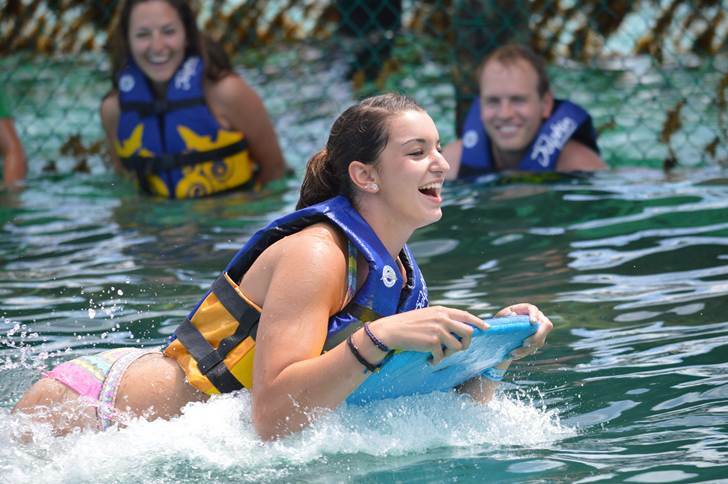 This boogie board ride will be powered by our beautiful dolphins so you can sit back and enjoy the fun. Tour groups are held to a maximum of 12 people in order to provide a more intimate and personal experience. Life jackets are required while swimming. The ferry from St. Martin to Anguilla is available on Monday, Tuesday and Saturday and takes approximately 45 minutes from one island to the other. 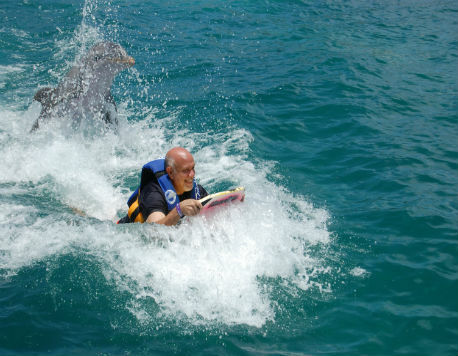 The dolphinarium in Anguilla is easily accessed from anywhere on the island by taxi. The island of Anguilla is just north of St. Martin and is approximately 3 miles wide and 16 miles long. With a laid back attitude and relaxing blue waters, you’ll enjoy the experience of swimming with dolphins in this Caribbean paradise. When visiting the Dolphin Swim Adventure, it's recommended you bring your own towels as well as carrying cash for meals, shopping, and personal items. For your personal safety, women who are more than 5 months pregnant are unable to participate in the swim with the dolphins program. If you have any medical or health concerns, please consult the call center for any details regarding participation in the swimming programs. Remember to bring along your Passport and visa as it may be requested by the migration department at the entrance in Anguilla. Consult your migration office for further information. In Anguilla-St. Martin, groups have a maximum of 12 people max for a closer experience. - Return time to St. Martin from the Dolphinarium 2 p.m.